The British pound fell to a 31-year low against the U.S. dollar today (Monday) as investors bet the Bank of England will cut rates after last week's Brexit win. The new low for the UK sterling currency has investors around the world worried about how the markets will react. Today's British pound crash means more volatility, renewed pressure on stocks, and a flight to safe-haven assets like gold, silver, and U.S. Treasuries. British stocks are tanking, having lost billions of pounds in value, and several banking analysts have slashed their British pound forecasts in the wake of the Brexit win. Global stock markets lost roughly $2 trillion in market value on Friday, according to S&P Dow Jones Indices. The UK's FTSE lost 3.2%, Germany's DAX declined 6.8%, and France's CAC gave back 8% on Friday. Indices in Spain, Portugal, and Italy fell 12.2%, 7%, and 12.5%, respectively. Ireland's key index lost 7.7%, and Greek stocks fell 13.4%. The Dow lost 3.4%, and the S&P 500 fell 3.6%. 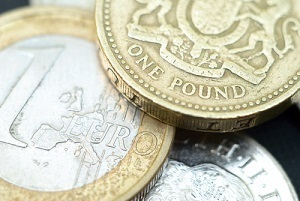 The dismal performance carried over to Monday as the British pound continued lower. The UK's FTSE dropped another 1.7% in morning trading today. Germany and France were each lower by 1.9%. The three major U.S. benchmarks were all off more than 1% in early trading. As stocks continue to drop, safe-haven gold and silver continue to climb higher. Britain's 10-year government borrowing costs sank below 1% for the first time in history. Britain's Finance Minister George Osborn said in a statement Monday that the country's economy will have to make "an adjustment" as it deals with Brexit. With stocks falling and the economic outlook uncertain, investors were quick to dump the British pound today and pile into the safety of government bonds. The pound's fall last week was the largest ever, declining more than 10% against the dollar intraday. The British pound's plunge continued Monday with a more than 3% slide against the dollar to $1.3221. The euro, meanwhile, rose more than 2% to 83.25 pence. That marked the euro's highest level in more than two years. "Uncertainty equals currency weakness, we know this, and there is no sense that this [sterling] is a value trade right now and that you have to get back in," Bank of New York Mellon in London currency strategist Neil Mellor said. "It is too early for anyone to start calling a bottom." Analysts at RBC Capital Markets said the clear risk for the pound is further weakness. The firm sees the pound falling to $1.20 to $1.25 versus the dollar. Deutsche Bank analysts see even more downside for the pound and forecast a drop to $1.15 by the end of 2016. "The UK's record current-account deficit means the currency is the in the worst possible position for the severe slowdown in capital inflows that will result from uncertainty generated," Oliver Harvey, foreign-exchange strategist at Deutsche Bank, wrote in a research note. They believe any uptick in the pound should to be viewed as a chance to sell. "A lot of issues in the UK are not going to be resolved anytime soon," Chris Weston, chief markets strategist at IG in Melbourne, Australia, told The Washington Post. "For sterling to rally, you want to see some certainty. Otherwise every rally is just an opportunity to sell." The lack of clarity from the UK as for what's next after the Brexit win will keep investors on edge. Markets hate uncertainty, and investors tend to react first and think later. That's what we saw Friday with the major sell-off. Even after a weekend to digest the news, investors were left with more questions and few answers. Investor sentiment for the next several months will be cautious since markets are guaranteed to be volatile. The key question is if the sell-off is a temporary shock reaction or the start of a stock market crash. Economists predict Brexit will knock 1% to 6% off UK gross domestic product (GDP): anything from a moderate slowdown to a deep recession. The International Monetary Fund (IMF) predicts a hit to global economic growth outside the EU of zero to 0.2%. We're just two days into Brexit. Lengthy uncertainty over Brexit means prolonged market volatility is a given. Continue to check back at Money Morning for frequent updates on Brexit and its impact on the global economy.